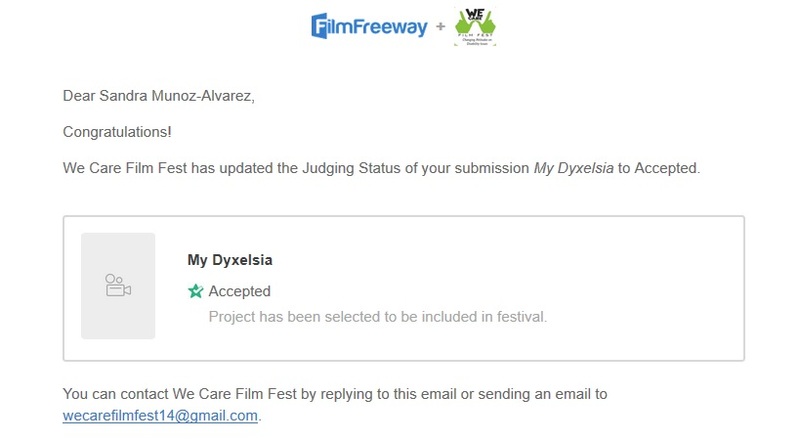 I am very please to let you know that “My Dyxelsia” short film has been accepted in another film festival …this time in New Delhi, India. We should know the result by May 2017. Building on the United Nations Convention on the Rights of Persons with Disabilities (UNCRPD) and its unique mandate on education, science, culture, communication and information within the United Nations system, BROTHERHOOD in close cooperation with UN Information Centre for India and Bhutan, UNESCO, National Trust (Statutory body of the Ministry of Social Justice and Empowerment) and Apeejay Institute of Mass Communication hereby announces the 14th global edition of the WE CARE Film Fest from January to May 2017.